Join us to celebrate Valentine’s Day with your loved one and enjoy Chef Jean-Francis Quaglia’s romantic multi-course dinner menus with Sommelier Rachelle Goudreau’s wine-pairings between 12–14 February. 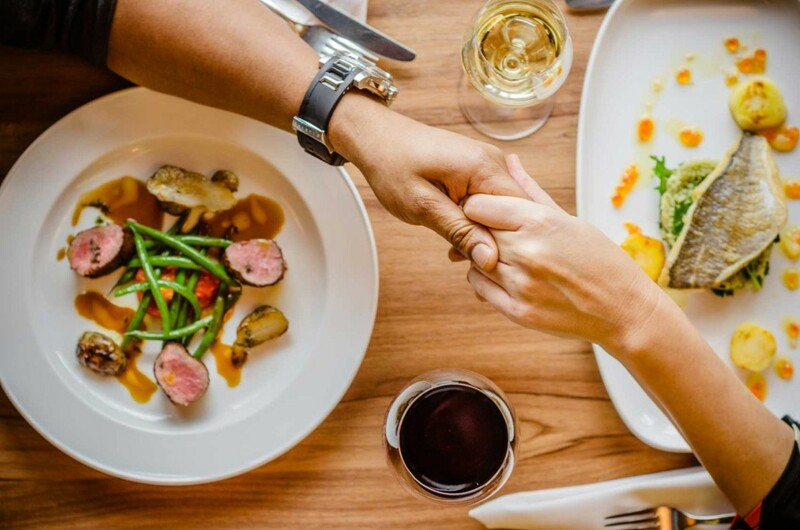 La Saint-Valentin is a 6-course dinner menu ($80 / wine-pairing $40) available only on Sunday 14 February, and Dîner de l’Amour is a 4-course dinner menu ($60 / wine-pairing $30) available on 12 and 13 February alongside our regular menu. Both menus will take you on a journey of Mediterranean flavours and whisk you away to a romantic oasis emphasizing the importance of life and love in our dining space. To get you started, Chef Jean-Francis Quaglia will tease your senses and set your palate with the Amuse Bouche. Once your palate gets a sensual taste, dive deeper with our BC Spot Prawns and Local Oysters that will enhance the freshness of your palate. 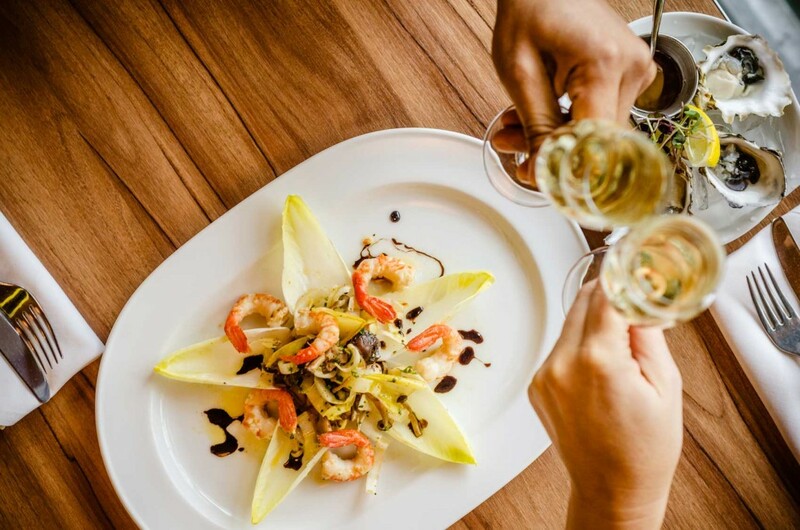 Sommelier Rachelle Goudreau compliments the natural sweetness of the prawns, brininess of the oysters (the legendary aphrodisiac) and earthiness of the endive with the vibrant fruit notes of the Blue Mountain Brut. As you swim in the depth of the ocean, your foodie palate will journey with the silky Crustacean Bisque and Dungeness Crab Ravioli. This locally fresh, sweet and tender dungeness crab is served with a classical fresh pasta swimming in a bowl of roasted crab and lobster bisque, that is ever so fine and smooth. This velvety texture is mirrored with the Pfaffenheim Grand Cru Pinot Gris, which is rich and textured on the palate with a subtle sweetness. Come up for a breath with a refreshing mid meal Sorbet that cleanses the palate. Then choose either to dive deeper or relax on land. If you choose to dive back in, the Seared Sea Bream Filet is light and flakey with crispy skin and is accompanied by parsnip, lemon vinaigrette and salmon roe. This dish is paired perfectly with the Viadero Blanco Albillo, crisp and refreshing with a rich and slightly floral finish, made with the very rare Albillo white grape grown in a small region in Spain. An ideal pairing to enhance the subtle flavors of the sea bream, the sweetness of parsnip, the tartness of the lemon vinaigrette and the wonderful rich pop of the salmon roe. If you choose to relax on land, the Butter Basted Lamb Loin is a New Zealand prime cut, served with fresh green beans, house smoked tomatoes, earthy sunchokes and a rich jus. Lamb and Bordeaux are such a classic pairing. Maison Blanche Bordeaux is a traditional style, medium bodied and well structured, which perfectly highlights all the savory notes in the cooked to perfection lamb, thyme, and juicy tomatoes. Continue the sweet seduction with our Strawberry Tiramisu, a fruitful take on the classic tiramisu without the caffeine and with delightful traditional house made macaroons and Thomas Haas chocolate. This indulgence is paired with Sauternes, the famous dessert wine from France. It is complex and rich, with a lovely acidic backbone to cut through the sweetness. Live and Love well this Valentine’s and allow us to seduce you with our multi-course dinner menus. How would you like to sail the Mediterranean to celebrate this Holiday Season? This month we’re offering an exclusive 3-course Holiday Menu for you and your loved ones, all for $58. Sail smoothly along the sea with our Crustacean Bisque, a traditional French creamy soup topped with chive chantilly, or take a minute to soak in the fresh sea breeze with our fresh Steelhead Gravlax served with salmon roe and frisée salad topped with horseradish vinaigrette. Continue your journey with our Seared Arctic Char and Scallops served with sun-choke and snap pea risotto and braised turnips, or throw down your anchor and enjoy the balance between land and sea with our AAA Canadian Beef Filet and Sautéed Lobster Duo served with wheat berry and butternut squash stuffed portobello mushroom with wilted winter greens. Then rest ashore with your choice of dessert, celebrating the year creating more sweet memories. Don’t forget the choices of our wines on tap to compliment your dishes. There are plenty to choose from and if you are stuck at sea, our servers will rescue you with their recommendations. 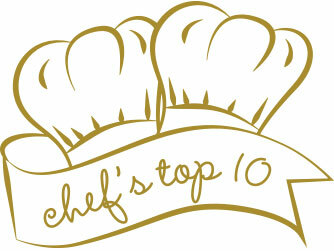 The Chef’s bring their best to the table during the Chef’s Top 10. Each week from 21 September 2015 to 29 November 2015, we will be featuring a Chef’s Top 10 dish with a wine pairing and our most popular dessert, the clafoutis, all for $40. Get to an early start and enjoy the fresh flavors of the Seared Lois Lake Steelhead accompanied with grilled asparagus, pea shoots, bamboo rice with a shellfish bisque vinaigrette. As the weeks get colder, take a risk and dive into the Bouillabaisse where French classic meets West coast style, prawns, scallops, mussels, clams, fish, saffron potatoes, gruyère et la rouille. If you prefer to stay grounded, grab onto a Rack of Lamb, crusted with dijon and fresh herbs, market vegetables. A menu isn’t the same without Rachelle’s recommended wines, so click on the icon below to get a taste of the menu. Be prepared and get rewarded! Receive a $20 or $50 *Provence gift card when you buy 5 or 10 **Chef’s Top 10 gift cards (respectively). Use them weekly or share them with your friends! Call us on 604-681-4144 to purchase. *Provence gift cards are valid at any Provence Restaurant or Bar and are not to be used in conjunction with any other promotion. **Chef’s Top 10 gift cards are valid for any Chef’s Top 10 meal from 21 September 2015 to 29 November 2015. According to Chef JF, tomatoes are the ultimate summer fruit. Not only are they ripe, juicy and brimming with sunshine, heirloom tomatoes present a wide range of flavours to tempt the palate. With the abundance of heirloom tomatoes available locally each year, we are celebrating with our 6th Annual Tomato Fest. Burst into these juicy tomatoes with this month’s three-course feature menu of Heirloom Tomatoes prepared for you in a various ways with optional wine pairings. Here are some recommendations from our menu’s selection. Allow our Chef’s to ripen your palate with the Tomato and Nectarine Salad. The natural sweetness of the nectarines bring out of the flavours of the juicy tomatoes, while the perfectly seared scallops melt in your mouth. Settle in with our Sommelier Rachelle who recommends the Synchromesh Riesling, as it is vibrant and fruit driven with a balanced dry finish. Stay out fishing for the silky texture of the Grilled Lois Lake Steelhead and Prawn Duo accompanied with the bright yellow tomato and warm vegetable salad, smoked plum tomato and black garlic vinaigrette. As the sun sets, the salmon hue of Le Vieux Pin Rosé, will compliment your evening with it’s delicacy and structure. Pair your fruit picked dessert such as the Berry and White Chocolate Clafoutis with the Late Harvest Cabernet/Merlot. Late harvest wines are less sweet then some dessert wines perfect for fruit based desserts, leaving you feeling sun-kissed. For more of the menu Click Here. Inspired by her travels, get a Taste of Cuba this Friday from our Dancin’ Chef’s Family Style Menu. Start with a complimentary Mojito and up-the-anti with fresh and juicy Mojito Shrimps. Settle down with Frikassé de Pollo and take a deep dive into Pescado Frito. Compliment these mains with traditional side dishes of Frijoles, Rice and Ensalata Mixta. Then sink into your seats with the soft custard Flan. See entire menu below. Be sure not to get too comfortable sitting. Shake your hips to live Cuban music all night from Provence Marinaside to the After Party. Step in to Havana Fridays at Lux Lounge (1180 Howe St, Vancouver) as a VIP with free entry when you reserve your seat to Taste of Cuba.